Car culture is dominated by men, largely because society (and car culture itself) unreasonably equates being a gearhead with being a man. Here are ten ways chosen by Jalopnik readers to help break down the barriers and encourage more women to become enthusiasts. 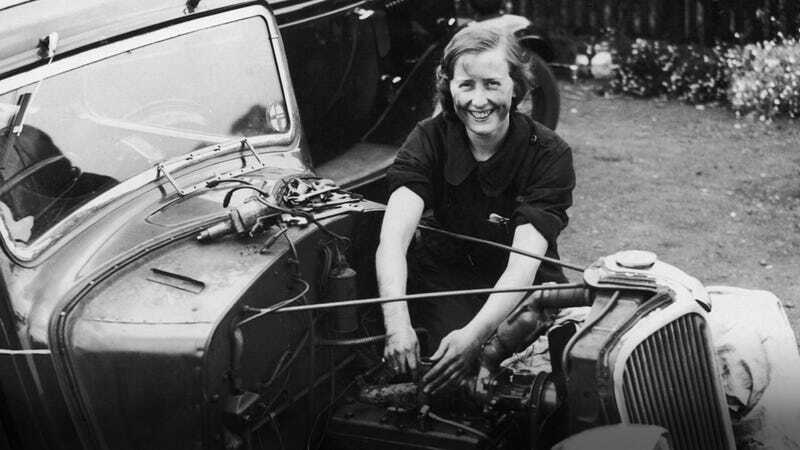 How Can More Women Be Inspired To Become Gearheads? Why it's a good idea: The show is like a gateway drug for car people and has an audience that's 42% female. The BBC standard takes a topic that's supposed to be "for men" and reaches a large female audience. How? First, the show is just damn entertaining whether you know everything or nothing about cars. Second, of all the people the show offends, it seems to go out of its way not to play to gender stereotypes. Take her with you to Auto shows with cars you can sit in. Why it's a good idea: If you want to interest someone in cars, don't just talk about them — let them experience it first hand. If a woman is a nascent enthusiast, the sights and sounds of a car show or race will excite the inner car nerd within. It's also a great place to meet fellow female enthusiasts (who do exist). Racing school. It will get them hooked. Why it's a good idea: The experience of speed is like a drug and sometimes all a person needs is a little time behind the wheel on a track to fully understand why cars are so much fun. Also, despite some comments by morons to the contrary, women can be just as fast as men around a race track. Why it's a good idea: As with all things, the best way to get someone interested in something is to brainwash them from an early age. While you shouldn't deprive a young girl of dolls or other female-centric toys, why not throw in a few matchbox cars as well? Why it's a good idea: The problem that many men have with explaining cars to women is that the men often act like they're talking to a child. "This is where the engine is," one might say. A very simple solution is to start explaining cars to actual children, ideally your daughter, but nieces and young cousins will do. The lesson is threefold: share your passions, speak to people respectfully regarding their age and experience, and start ‘em young. Why it's a good idea: Car culture tends to use women as props instead of icons. That's not to say that there aren't successful women with key jobs in racing. We have a whole list of awesome women drivers, but there are more women today not getting the coverage they deserve. There's Leena Gade, the first woman engineer to win the 24 Hours of Le Mans, her sister Teena, who is lead engineer for Mini's World Rally Team, as well as Cara Tredget and Lucy Taylor, the technical manager and trackside analyst for Shell Oil in Formula One. Why it's a good idea: It's very easy to feel intimidated by mechanics regardless of gender. When you're working on a car, there should be less "Watch me do this" and more "Help me do this." If you want to engage with someone with your interests, you have to get hands-on and not stay aloof and abstract. Why it's a good idea: While you might be really fascinated with your new intercooler or how Michael Schumacher just isn't readjusting to Formula One like Kimi Raikkonen, your friend may find your discussions boring at first, then tiresome, then really annoying when you try and force her to get involved. You're going too fast, respect her limits, and recognize the point where she isn't interested and she might not ever be. Less sexism on track for all, be they spectators, racers, engineers, etc. Why it's a good idea: This is where a lot of sexism in car culture comes from. Not enough girls are getting invited over to drink beer and change people's transmissions in their driveway. Guys fail to leave the door open for girls to get involved. A project car can be something that husband and wife can share; a trip to the car show is something that a couple can do together. You have to be open to women getting involved. Also, don't assume they don't know more about cars than you do. Why it's a good idea: The whole point of this list is to avoid the douchebags and leering sleazeballs, and make it so a woman doesn't feel like she's different, disrespected, or left out. Do the opposite of this. Don't make gender the big issue and, as always, don't be a massive tool.